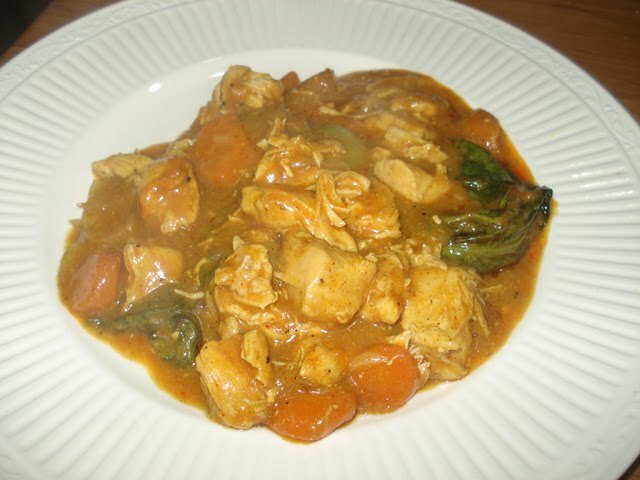 We love eating curry in Winter and I have been making a very tasty chicken curry lately that is easy to prepare and suitable for the slow cooker. If you don't have one, simple cook it on the stove. Served with boiled rice or some crusty bread on the side, you have a delicious warming meal for a cold night. I added baby bok choy from our garden but you could add anything you have growing or whatever you bought at the market. If you're cooking this on the stove, add the oil and curry to your pan and let it cook on medium for one minute. Stir to avoid it burning. curry powder or curry paste to suit your taste - I used two level tablespoons of powder. Check the instructions on the side to see what the ratio should be. When the curry has cooked for a minute, add the other ingredients, mix, bring to the boil, then reduce the heat to low and let it cook slowly for one hour. Chop 300 - 400 grams (10 - 14oz) of boneless chicken thigh into bite size pieces. If you're cooking it in a slow cooker, don't use the oil, but add everything to the cooker and turn on to slow for an all day cook. That's exactly what we will be having for dinner tonight. My recipe is very similar to yours. very tasty. Hi Rhonda ,sounds very warming and with minus 4 for the last 4 days sounds like a winner to me lol we are not used to so many frosts in a row! it is winter so we will just have a roaring fire a lovely curry and fresh baked bread,yum. Yum! I made a chicken curry dish the other day for my teenage kids and their friends, using up bits of leftover chicken and random veggies that were on the verge of needing to be tossed out. I made a huge pot of rice to go with it. They ravenously devoured it all and wanted more. Cheap, filling and delicious! Can't ask for anything more than that. Bookmarked this to make next week. already looking forward to it! Sounds so yummyy!! I will give it a try.Thank you! we love curry and I always welcome a recipe for the slow cooker. Thanks for the recipe Rhonda. We will be making this tonight but i will be substituting the chicken for potatoes. We only buy free range whole chickens and the price has sky rocketed lately. Its nice to have a few meatless dinners through the week. I have also been making curries(mainly vegetarian with pumpkin and cauliflower)in my slow cooker - I read just yesterday that they are back in fashion and one of the most popular small appliances around at the moment. Should have bought one years ago - now I have two. One for curry or soup and a smaller one for self saucing puddings! I love to use my crockpot and am always on the alert for good recipes. There's nothing like the smell of something awesome when you walk into a kitchen. Thank you for the recipe. Sounds delicious. I often make a similar recipe using sausages, and also green apples and sultanas. That sounds delicious! Thanks for the recipe Rhonda! oh yummy, I have a chicken curry recipe that my Grandma used to make. Perfect meal for a chilly day. Hi Rhonda, went to Aldi today and came home with chicken and coconut milk. Guess what's for dinner tomorrow night! Oh, this does sound so amazing--it's summer time here in the southern U.S., but I think I shall fix it next week with some Jasmine rice. I'll definitely use the slow cooker so I won't heat up the kitchen! Thanks for the recipe. Looks like it would be a winner with our kids.